Lock, hide and encrypt any number of files, folders, pictures and documents in seconds. 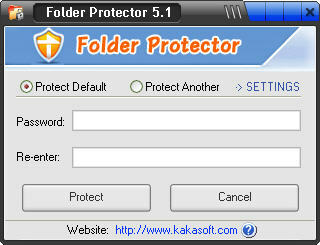 KaKa Folder Protector is a powerful and easy-to-use program for protecting your data. It can lock, hide and encrypt any number of files, folders, pictures and documents in seconds. It is fast, reliable, portable and convenient. You can choose whether to lock, scramble or encrypt files, depending on the speed. Folder Protector provides the convenience of protecting all files and folders in one place by a simple drag and drop. Protected files and folders are undeletable, unrenamable, unmovable, hidden, locked and totally inaccessible. Folders can also be protected on portable devices like USB flash disk and removable hard disk, The program works perfectly on all 32-bit versions of Windows i.e. Windows Vista/2003/XP/2000/NT/Me/98, and all kinds of disk types like FAT16, FAT32, NTFS & EFS. Three Methods: Lock, Scramble and Encrypt Folder. Depending on the files you protect. On the Fly Protection: Using the Strong protection technology that can effectively lock/encrypt all your files. Strong Encryption: A strong industry standard 256-bit BLOWFISH Encryption is used to encrypt your files. Portability: Folders can also be protected on portable devices like USB flash disk and removable hard disk. Drive Firewall: Allows you to protect your data from virus and other bad software. Security: Protected files are totally hidden and locked, undeletable, unmovable and totally inaccessible. KaKa Folder Protector can lock, hide and encrypt any number of files, folders, pictures and documents in seconds. It is fast, reliable, portable and convenient. ID Folder Protector - It locks, hides, encrypts and protects from viruses, Trojans and spyware, files and folders you wish to keep for your viewing only.